Utforska Yellowstone National Park med din egen privata guide på en dagsdagstur som skräddarsys efter dina intressen. Besök sevärdheter, inklusive Old Faithful, fontänens målarpottar och Grand Canyon of the Yellowstone, och leta efter vilda djur som älg, bison och älg. Du kommer också att höra om Yellowstone naturhistoria och geologi från en naturalistguide på denna personliga rundtur på en av Wyomings främsta destinationer. Inkluderar frukost och lunch, privat fordon och hotellhämtning och avhämtning i Jackson Hole. Jody, our tour guide was amazing! Very knowledgable and friendly.He accommodated our every needs. Saw bison, and tried to see Bears, but no luck. He was great to text us the next day of some bear sitings , but we didn't get there fast enough. Told us great places to fish and hike. He was worth every penny we spent, and it was nice for our family to have him all to ourselves. He is also great with photography and helped us with our cameras. Taught us some new tricks to use with the Iphone. They also provided each of us with binoculars that were fantastic. I am going to go buy a pair for myself. This is not a complaint but a more comfortable car would be better. He said they were looking into getting new cars. We did have plenty of room for all 6 of us. 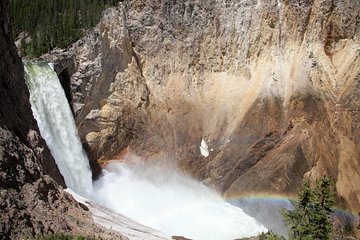 If you want a great tour of Yellowstone this is the tour! It lasted 12 hours.